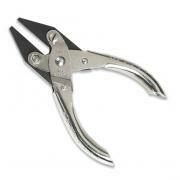 Detailed listing of our Datacom cutting pliers. The curved cutting blades are hardened to handle coaxial cable up to RG-9U, Multi-conductor cable up to .500 inch and wire up to 8 AWG. 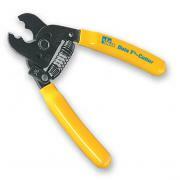 With return spring and comfort handles cutting cable is a breeze. Parallel action and smooth flat jaws are perfect for snapping down covers on crimpless keystone-style connectors. Get exactly what you need with a custom tool kit from Tecra Tools. Get tips & information for field service and MRO professionals. All graphics, copy, coding and layout are © copyrighted by Tecra Tools, Inc. All Rights Reserved.